“We recognize the opportunity the cannabis industry provides for Alberta and Calgary to diversify its economy and want to collaborate and facilitate the growth of the industry here in our city,” said Alex Wihak with the city of Calgary. When cannabis legalization goes into effect across Canada on Oct. 17, the door will open to a multibillion-dollar industry – for businesses that can wrestle market share from the illicit market. Seventy-six of the 588 companies awaiting a license to be a cannabis producer are in Alberta. Calgary hopes to convince some of them to plant their flag at the Point Trotter Industrial Park, which has 186 acres available in the first two phases of development. While it is not exclusively for marijuana businesses, it is an industry the city is specifically marketing these lands toward. The city’s Real Estate & Development Services (RE&DS) business unit is spearheading the initiative. The agency’s job is essentially to leverage Calgary’s property assets to benefit all. Executives contacted by Marijuana Business Daily say the proximity to Calgary workforce and transportation facilities are an advantage. In addition, RE&DS says it has experience with Health Canada’s licensing process and can help companies getting the requisite permits. RE&DS is willing to provide a company with an additional due diligence period, so it can gain more certainty that licenses will be granted by Health Canada, which means a smaller financial commitment prior to federal approvals. Synergies and partnership opportunities may exist because of the cluster of businesses engaged in same industry and similar activities/operations. The land is fully serviced and construction ready, providing more cost and timing certainty. So far the city has sold a 1.06 acre lot for the development of a 10,000 square foot facility for a cannabis company. Calgary is also under contract with a current Health Canada applicant that is proposing to develop a 65,000 square foot cultivation facility, with future expansion planned on a total of 4.7 acres. Some extraction/processing also will occur there. Another Health Canada pre-applicant wants to develop a 120,000 square foot cultivation facility with future expansion capability on 4.56 acres. Pinnacle Biotech – a consulting and managed services firm for cannabis cultivators – said it plans to build a production facility in the Point Trotter Industrial Park later this year. Phil Holmstrom, co-founder of the industrial park, said its advantages include assistance from the city, ready access to city services and location with like businesses nearby. “When we were looking at locations, our first question was ‘is the municipality friendly or not?’ And Calgary is,” he said. Calgary is open for cannabis business yet public consumption will not be allowed. 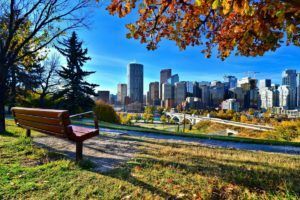 Smoking is regulated at the municipal level in Canada and Calgary city council said “No” to cannabis. Oh, except for authorised medical users – which makes no sense at all. Who’s smoking what now? Actually I have been waiting since 2014 to see if the City would get on board. My question to the city is : why again are you coming to the game a little late. This industry has been around for many years now but we haven’t heard a thing from the city all that time. The province is just as much at fault as I was under the impression that “we” were looking at ways to diversify the economy. Other provinces and other cities and communities in Alberta have stepped up long before this time sooooo what happened again ?. Maybe they didn’t realize how much money , employment and spin off industries cannabis would generate and were afraid to get first mover advantage. A bit of investigation and forward thinking would have gone a long way. If Calgary is really wanting to get all in then why are the restriction for dispensary locations so ridiculous. A bit more out of the box thinking is needed if Calgary is really serious about this business. This cannabis industry is a world wide event now and for years to come and it is unstoppable with Canada leading the charge. I surely hope the City reevaluates its positioning and gets up to speed before another four years slips by. The insane amount of money wasted on the Olympic bid idea should have been used more wisely on the cannabis industry program and the payoff would have been huge. At least the city has seen the benefit of a cannabis industry I just hope its not to late again.